Following two thirds on the course and solid recent form, Wonder Woman (4 m Showcasing – She’s Invincible, by Elusive City) gained deserved success in the $10,000 Burton Construction Rating 65 1215 metres on 17 January at Rotorua. Given an assertive ride by Jake Bayliss, who combined with stable-mate Ruby Armani (Makfi) to win on Sunday at Ellerslie, Wonder Woman worked forward to lead at a solid clip, had gas in the tank turning in, and won well after establishing a two length advantage mid straight. “She’s very honest and really deserved the win,” said co-trainer Pam Gerard. “All her runs have been really good and she had probably wanted the blinkers on, but can get a bit hot on race day and doesn’t breathe quite right. So, we’ve always just settled her back, got her running home and breathing nicely and today with blinkers on the plan was to go forward. Owned by Bradbury Park Wonder Woman Syndicate (Mgr: Leigh Noble), the Office Syndicate, and Brendon McCullum (Vermair Racing), Wonder Woman was bred at Bradbury Park, Matamata, the first foal of She’s Invincible, a four time winner that impressed over 1200 metres. Wonder Woman is from the family of New Zealand Horse of the Year Seachange (Cape Cross), Levin Classic (Gr. 1, 1600m) winner Keepa Cruisin (Keeper), and stallion Yachtie (Broad Reach). She also boasts a lovely pedigree cross with Danzig (Northern Dancer) and Gone West (Mr. Prospector). After winning on debut as a two-year-old, Wonder Woman contested both the listed Gore Guineas and Dunedin Guineas at three. “We sent her to the South Island for some black type, but probably nearing the end of her campaign,” Gerard said. “The tracks weren’t quite right for her and things didn’t go right, but she’s a good mare and deserves to get some black type. On footing offering a nice amount of cushion (Dead5), Wonder Woman ran the 1215 metres in 1:12.0, last 600m in 35.6, and paid $5.10 & $1.80 on the NZ TAB tote. Wonder Woman was strapped by Archie Hazlett. It was a win at his first attempt in the role for Archie (12). 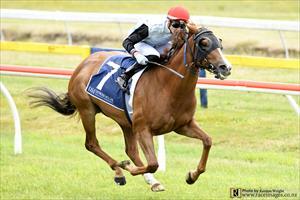 The son of co-trainer Pam Gerard and Tommy Hazlett, he too has the right pedigree and experience to excel.